Except that when I cut into the giant citrus that was sold to me at the farmers market as pomelo, it turned out not to be the usual white pomelo I was expecting, but some type of pink pomelo. 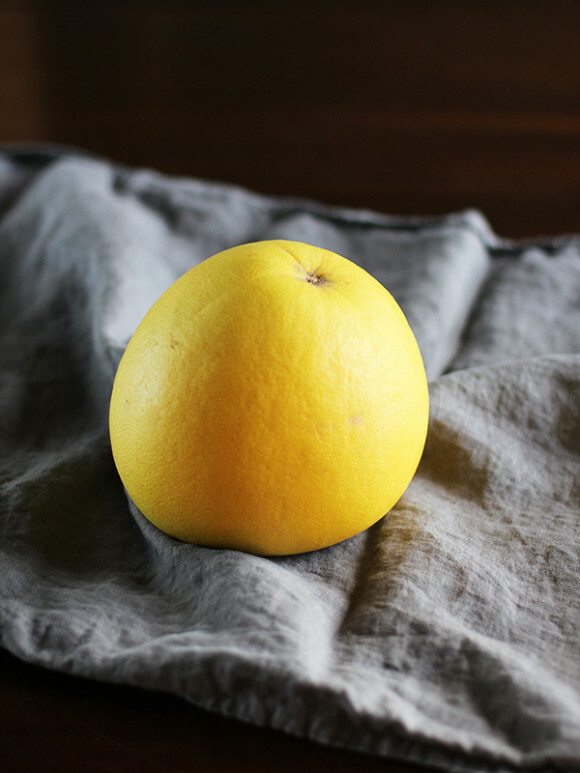 Pomelo flesh is usually sweet, yellow and dry-ish, so it is easy to separate into segments and store in a container in the fridge for snacking throughout the week. This pink specimen was juicy and drippy, so separating the flesh was a messy, ugly business that I took care of over the sink, eating almost the whole thing as I did. It was nothing to post about; it wasn’t pretty, though it was delicious. But it struck me as I was peeling apart the pink segments that the surprise pink pomelo — the pomelo that resisted my big plans for it and was not at all what I expected it to be — is probably an even more appropriate accompaniment to my big news, which is this: I am about 18 weeks pregnant, expecting a baby in early June. So I hope you can forgive the recent blog silence, as I had debilitating all-day morning sickness throughout the first trimester and subsisted on a rotating list of takeout dinners, buttered toast, fruit and dry crackers for most of the fall. I couldn’t face cooking anything, not even an egg, for about five weeks. I couldn’t look at food blogs or Pinterest or Instagram. Even thinking about food made me sick. It was a difficult time, to put it mildly. But all that has ended thankfully, and I am cooking and eating pretty much normally again. Rob and I are excited and of course a little terrified about everything ahead. I feel most secure when I can plan far in advance, especially when it comes to the big things in life, but of course I can’t plan for who this new little pomelo will be. Expectations and plans be damned, he or she is, and that is more than enough for me. Thanks, Joanna! I’ll never take my appetite for granted again…. Thanks, Jessica — and yes, I’m happy to be eating plenty of greens again! Congratulations! That different variety of pomelo sounds interesting, and I love the way you used that metaphor leading into the big news. Congrats again! congrats! that’s way better than a story about pomelo! Congratulations! I just discovered (and subscribed) to your blog a few weeks ago, and was very excited to have another source of food inspiration. How wonderful to discover that not only do I share with you a love of food, but also a common due date–I am also 18 weeks pregnant (with #2 though!). Anyways, good luck on your pregnancy journey! I am definitely looking forward to your future posts! Yeah, yeah, yeah! So excited for you! Congratulations! So very happy for you! I hope the rest of your pregnancy is nausea free for totally selfish reasons – so we can have more of your gorgeous recipes! Hi Anjali. I came here to get a recipe to send to my co-worker (for the energy bar, if you must know. The BEST THING EVER! ), and I am delighted to see your happy news, especially since I’m off FB for a while. Congratulations! I’m so, so happy for you and Rob. I cannot wait to see how ridiculously cute this kid will be, thus knocking N off his throne of cuteness. All the best for a smooth ride for the rest of your pregnancy and I hope that you’re able to rest up. Take good care of yourself, and let others take care of you too! Anjali! Congratulations! You know, I was in Nagoya in November and was thinking about when I met you and Molly there. It seems like eons ago! Congratulations Anjali! That is wonderful news. Anjali, congratulations on your pregnancy! I read a post today from you today that appeared on another blog that you no longer drink almond milk. I currently drink almond milk, but I usually put it on my cereal and make smoothies out of it. After reading your article about the negative things in almond milk, I want to switch back to 1% milk. I can’t stomach skim milk for my cereal, but I don’t mind the taste so much if I’m making smoothies. What type of milk do you drink now? That is the kind of pomelo we get where I live, in Sri Lanka. We call it jambola. I used it to make the grapefruit guacamole recipe that was on The Kitchn recently. It was fab, fab, fab!!! Saw your article on pomelo via your article on tips for crispy bacon at Apartment Therapy. Terrific idea, will try soon. My tip on eating pomelo, it’s an annual occasion during the mid autumn festival in Taiwan. 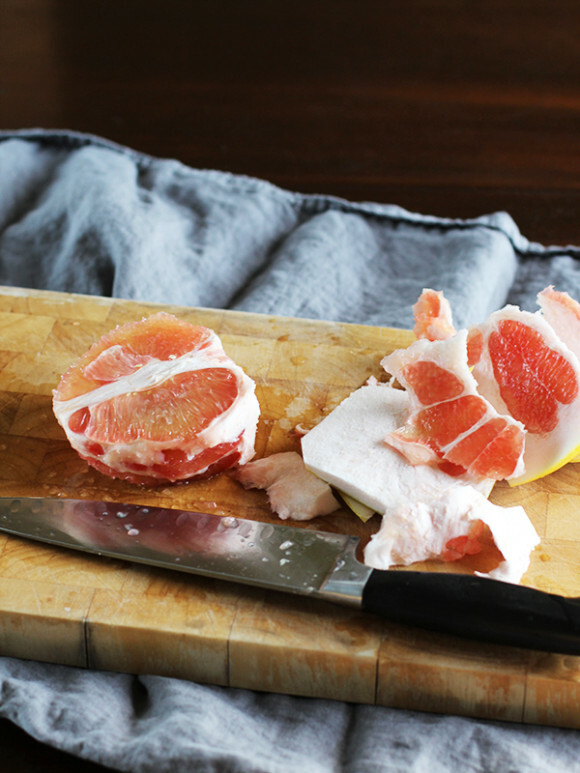 Carefully slice off top of pomelo without cutting into flesh. Then make half incision from top to near bottom right round the pomelo. Now you simply peel back every petal along with as much of the pith as you can. You will end up with a peel pomelo. Now simply break off segments and peel back the tough skin.